Excellent venue and the staff were very helpful. We used the Corn Exchange as a location for training sessions that we run. The staff were great and happy to help with anything we needed. We will definitely be using the venue again. This was very easy to book, we had a pre meet before our event to discuss how the table and chairs were to be set out. We were emailed a floor plan before the event. Good service from start from finish. Always my first port of call when booking a venue in St Ives. The staff are always very friendly, helpful and understanding, especially when I have to make last minute adjustments to events! Thanks for all your help over the years. The Corn Exchange was a wonderful venue for our birthday party. The room looked fantastic and the kitchen and audio facilities were excellent. All the staff from the booking ladies to the bar staff went out of their way to make the evening special. As Huntingdonshire Athletics Club membership has grown, so has its need for larger premises for its annual Awards Presentation Evening. This need has been met by the St Ives Corn Exchange premises over the past few years. What makes this place special is the professionalism of the preparation by the Corn Exchange staff – all tables and chairs set out, PA system in place and bar staff ready to serve. Truly a turnkey operation. It’s a real plus to show up and concentrate on the event rather than being concerned about the layout of the hall. I wish I could come up with ways to improve things but I can’t think of anything. Keep up the great work! Debbie and Marilyn, thank you for organising all the logistics for Mr Downson and Sarah’s shows. You have been very helpful and accommodating. The shows went really well. It made a difference to the event and made a lot of dancers and parent happy. Also thanks to Rob and Roger. The sound, lighting and backdrop projection has never been this good for these charity shows. I use ‘The St Ives Corn Exchange’ as one of my carefully chosen event venues for a number of reasons. Firstly the location (Which is key), is both central offering plenty of nearby parking in a town that offers many reasons to visit with its rich history and attractions. It ensures both convenience for the dedicated holistic fair customers plus invites passing trade to have an introduction to our warm and welcoming events, leading to an increase in interest and repeat custom. 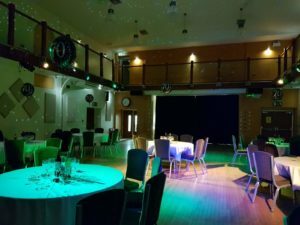 I continue to use this year after year because of the courtesy and good service which helps to ensure my events run smoothlyWe held our presentation night at The Corn Exchange and the venue was comfortable and it created a relaxed atmosphere. We held our presentation night at The Corn Exchange and the venue was comfortable and it created a relaxed atmosphere. The staff were very accommodating during the booking, settting up and on the night. Just a little note to say a huge thank you for all of your help regarding booking the corn exchange for my sons first birthday! The party was a huge success thanks to all of your help and organisation. A very smooth process indeed for which I am very grateful of. Everyone loved it! Thanks again and I wouldn’t hesitate to hold a private function here again in the future! I’ve booked the main hall for a few years now and am always highly satisfied with the service provided, both before and during our event. As usual, our annual event went without a hitch, thanks to the helpful staff at The Corn Exchange. We are very pleased with the service we receive from the Corn Exchange. Lovely to meet the ladies when I popped in. Everyone we spoke to, each step of the way was helpful and quick to respond. Debbie and Jade (bar) are great at what they do and are very supportive and friendly also! Cannot thank you enough – r’ships that we have built make these events so much more enjoyable! 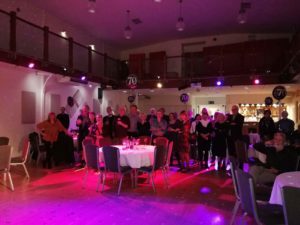 The service in provided was of high level with regular contact, which gave peace of mind and confidence regarding the event we were looking to hold. For the Ouse Washes Landscape Partnership’s first conference, for over 110 attendees, we chose the beautiful and practical facilities offered by the St Ives Corn Exchange. With a very good range of facilities and helpful staff and volunteers on hand, the day was a great success.